Like most people I’ve gone through a number of hobbies, photography now being the greatest one. 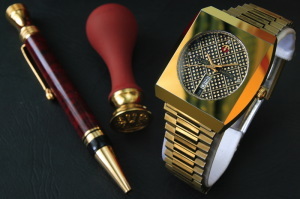 However the fascination with watches is one of the oldest. In general, I’ve always liked anything small and complicated, anything with tiny clicking bits. My very first watch was probably a yellow plastic Garfield watch that Mum bought for me. According to her it was a pricey timepiece. Given my age, I think anything above $2 would be considered a pricey item. So old and obscure is this watch that I can’t even find a photo of it online, and I can’t even photograph it for you to see because it’s overseas, stashed away in a shoebox with a dozen other cheapie watches I amassed over the first decade of my life. The second serious watch (ie. daily wearer) was a tiny analog Casio watch, probably designated as a women’s watch, but worked well for a sub-10 year old at that time. It had a black dial and cheerfully colored minute, hour and second hand. Around this time I learned all about ‘water resistance’ in a watch and became obsessed with it. This little Casio was good for only 50 meters but that was all fine. The beach was my favorite hangout and the watch accompanied me everywhere, including bath time. I probably never took it off. I was very curious in those days and spent much time rummaging through my parents’ dressing table when they were not looking. In it I found two watches, a strapless Jaeger Le Coultre Club and an old Rotary with an original strap (more about this later). I begged my Dad for the JLC (funny how, despite my age, I knew which was the more expensive of the two) and he initially refused. I didn’t think much about it and went straight to bed to prepare for the next day of school. But then I overheard my parents talking, and shortly after Dad placed the JLC under my pillow. I was thrilled with my first mechanical watch and had it in my pocket for a good length of time. It continued to work well, at least until the minute hand warped and got stuck between the markers on the dial. I stupidly tried to take the watch apart to repair it and wrecked the thing completely. Needless to say, I’d give a lot to get the same watch back today. It taught me an important lesson: If it ain’t broke, don’t fix it. If it is broke, don’t open it yourself! At around 10 years old, I bought a Lorus Mickey Mouse pocket watch (from memory it was $69, my own savings) a few more Swatch watches, mostly quartz, but one automatic. These were courtesy of gift money from my grandfather, who passed away early last year. They are lovely watches but were never my daily wearers. I still have them today and they’re in pretty good nick. During those years I started to pay more attention to what was on my Dad’s wrist, a two-tone Rolex Datejust with a fluted bezel. On a couple of occasions I tried it on for size, again when my Dad wasn’t looking. A foray into the models of that brand name led me to the advertisements on the back of those Readers’ Digest magazines. 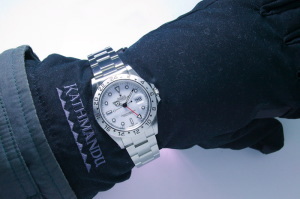 That was when the Rolex Explorer II first caught my eye, and it became my grail watch. An officially certified chronometer, and a lovely model name. I always wanted to think of myself as an explorer in some ways, mostly because I liked open space, the sea and quiet forests. Note: If any of you have copies of these Readers’ Digest advertisements for the Explorer II and would be able to send them my way instead of throwing them out, I’ll be happy to shoot the postage fee your way via Paypal. Serious!! 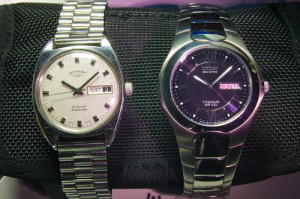 The Rotary (see left), which was the only other old watch left in my parents’ dressing table was given to me at 11 years of age after doing well in my final exams. It is still working after 16 years in my hands. I used to kid myself that it could be a family heirloom and it’s probably worth as much to me, at least in terms of sentimental value. The next year I got my 3rd serious daily wearer, also a Casio, a quartz all-stainless, mid-sized diver with a rotating bezel, attractive polished case, and almost the look of a the Rolex Submariner’s evil twin. Beautiful watch it was, and that was on my wrist for a good 4 years until another Casio took its place. This was in turn followed by a watch under a cheap, obscure brand, ’25 hours’. On my 21st birthday I received a titanium Citizen Ecodrive from my parents, which I wore for the next 5 years. Both the technology and the material of the watch were fitting for my strange taste for geekiness. This is a dressy watch that’s equally suited to casual use. The movement is powered entirely by solar energy, which is harnessed by a solar cell hidden behind a translucent black dial, and stored in a rechargeable cell. When fully charged the watch can run for approximately 6 months when left in total darkness. Under normal conditions a watch like this would never stop running. 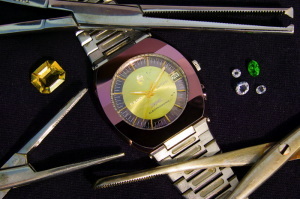 It was a solid timepiece but marred easily, presumably because the titanium is just too soft. In the early part of 2008, after much saving, I could finally afford to take a white-dialed Rolex Explorer II home. I was surprised at how much it cost, even for a second-hand 1999 production model. Later I was even more surprised to hear how much the thing costs brand new in Switzerland where my parents previously had a vacation, and hence continue to tell (read: deceive) myself about how good this deal was. On my 6 inch wrist the watch looked a bit strange initially because I had always worn small watches, and the watchmaker even had to break a link to get the bracelet to fit. It’s an utterly beautiful watch with an understated elegance. The brushed surfaces of the case and that of the fixed bezel are hard-wearing, yet both are set off by glossy, polished highlights that catch the light at some angles. 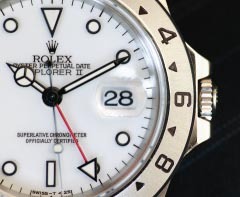 The sturdy, screw-down crown is adorned by the famous Rolex crown logo, and further protected by polished guards, which are extensions of the case itself. The dial design is simple and legibility is high. That is not to say the design is spartan. Besides the usual crisp Rolex printing, the luminous triangular marker at 12 o’clock, rectangular ones at 9 and 6 o’clock, plus the round ones at other hours (except at 3) are distinctive, as is the Mercedes design of the hour hand and the single balled end of the second hand. In my opinion, the two most significant design elements on the face are the red GMT hand and the cyclops over the date window. The former can be used to track a second time zone, or simply synced with the 24 hour non-rotating bezel. It can be adjusted backwards or forwards (and hence adjust the date) without disturbing the minute and second hands. In reality it is of little use to me, but the red and black colors are just so nicely set against a pure white dial. Speaking of white, the Explorer II is a timepiece that conjures up images of snow-capped peaks, vast icy wilderness, wolves and polar bears, and like its namesake, explorers dressed in thick parkas and yielding ice picks. That is a special aura like no other, a watch that speaks of the strength of human will and adaptability. The elements of the watch face are protected by a hard-wearing sapphire crystal, supremely scratch resistant and right up there in the Vickers scale along with high-tech ceramics and hard metal (eg. tungsten carbide, stuff found in the nib of your ball point pen). The Oysterlock bracelet is functional, not showy but bearing some presence nevertheless because of the relatively large, solid links. It’s comfortable to wear, doesn’t pinch, and doesn’t pull your arm hair off. At the heart of the watch lives a calibre 3185, 31 jewel, COSC certified automatic movement with about 2 days of power reserve. Its high beat makes the action of the second hand smooth and classy, while the tried and tested movement keeps time with astounding accuracy against a modern quartz and LCD watch. The Explorer’s asset is really its unobtrusive appearance which in turn prevents it from being a ‘one-trick pony’. The watch looks as good on a day out fishing as it does with a suit during a black-tie event. While substantially bigger than what would normally be accepted as a traditional ‘dress watch’, it still slips easily under a sleeve. When checking the time however, be prepared to receive some glances from those around you! The Explorer II simply doesn’t feel out-of-place anywhere, except perhaps the odd paintball game. 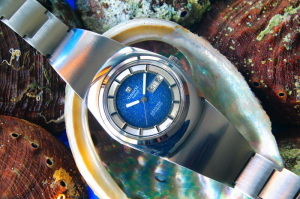 The water resistance is guaranteed to at least 100m, although Rolex seems to advertise that their watches would tolerate pressure under water to way beyond their guaranteed limit. For the vast majority of mortals who only get as wet as a swim in the pool or a little snorkel in the sea, such water resistance is more than enough. As human nature would have it, the Explorer II doesn’t hold nearly as much mystery for me now that it’s in my hands, compared to my younger days when all I had was a photo of it. But even though other expensive watches (though less so than this one) are now on my radar, none of them would hold as much significance as this watch does. One should never underestimate the importance of a childhood dream, fulfilled. The purchase of this watch has unwittingly sparked off a recent buying spree into some weird and wonderful vintage watches, some of which I no longer have. But for sure, this hobby is far from over. So, what’s your Watch Story? PreviousPrevious post: Scooterer Stories part seventeen, Tiberias, Rama and a Druze Wedding. i still prefer mechanical watches over digital watches because of the more traditional and classic look’*.